1985’s Friday the 13th: A New Beginning is a real oddity in the Friday the 13th movie franchise. After Friday the 13th: The Final Chapter (which we all know was far from it) Jason Voorhees was legitimately dead. Not the living dead or the walking dead, just plain old straight up dead. 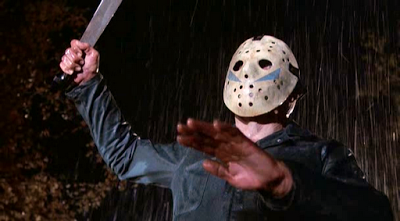 It’s easy for people to remember that in the original three installments of Friday the 13th that Jason was in (every self-respecting horror fan will know who the killer actually is in the original 1980 film) he was nothing more than a legitimate maniac in a mask murdering people. There was nothing explicitly supernatural about Jason. Yes, this has problems with the canonized and infamous rise from the water at the ending of the original installment and the fact he could take a huge amount of punishment before being stopped, but for the most part that’s simply all he was portrayed as: a killer who could take a huge amount of punishment, and a strong one to boot. By the way, from here on in, major spoilers. By the time 1984’s Friday the 13th: The Final Chapter rolled around however Paramount Pictures had decided it was time to kill their iconic killer once and for all. After the surviving the fairly convincing axe-wound to the head in Friday the 13th Part III however it was clear that to kill him they’d have to top that. And this is where you have to give praise to A New Beginning, at least for idea and effort and not for execution. In a way, A New Beginning did hold true to The Final Chapter. The killer Jason Voorhees really was dead and buried. A New Beginning really does say “Jason is not coming back, that really was his final chapter”. Now yes, of course one can argue that “The Final Chapter” was originally referring to the end of the franchise, not just Jason himself, but it’s no less feasible to posit that the franchise at that point was Jason Voorhees and thus without him, in a way, the franchise is reborn. Think of it like Star Trek and Star Trek: The Next Generation only The Next Generation was only a year later than the original series and only lasted one season before the original cast came back out of retirement. As I’m sure you’ll know if you’ve read down this far, it transpires that Tommy Jarvis (played by John Shepherd in this movie), the person who chopped Jason up into a psycho mince in the previous installment, is now the killer. The logic is admittedly a little confused in it’s use of narrative choices here. As a standalone it kind of works in it’s choice to make the audience believe Jason has returned to kill again, only for Tommy to be revealed as the real killer. On the other hand, the ending of The Final Chapter left us with the very Omen-like image of young Tommy smiling menacingly at the screen, indicating that he had been twisted and disturbed somehow by his own violent deeds - the suggestion that he very much enjoyed the act of killing he’d just achieved. Combined with the following film it should be clear that Tommy would be the person to take up the hockey mask. So why try to deceive us, only to give us the answer we expected all along? Did they think audiences had memories that short? Either way it was a difficult situation for Paramount Pictures to have put themselves in and it’s hard to imagine how they’d have gotten around it. Audiences were expecting a slasher in the vein of the franchise, yet immediately and obviously swapping Tommy in would not only be boring, but make a film so similar to the now finished original sub-franchise that it would be seen as a trashy imitation. Yet the route they took somehow failed to remember the very last shot of the preceding entry in the franchise. Having said that A New Beginning does an admirable job of a double-double switch over the killer’s identity. Admirable, but also a very, very stupid one. Granted it is clever how the killer’s initial false reveal does revolve around the comparatively subtle mention of Tommy’s ability to make great halloween masks, but the speed needed to achieve his twist, as well as the fact he couldn’t possibly know where the final confrontation would take place, is absolutely nonsense. Still, this allows us the final hospital scene, and perhaps the virtue of the slasher genre is that we will allow it to make some pretty ludicrous leaps of logic that we wouldn’t let slide anywhere else. As such we are pushed into believing the false killer was the real one long enough for us to believe it. The scene in the hospital room with Tommy is therefore effective, and the image of Tommy in the hockey mask (let’s not get into how Tommy got the hockey mask into the hospital) and night gown behind his victim is one of the most potent and lasting the series has. 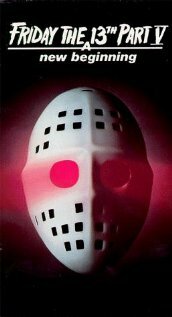 Friday the 13th: A New Beginning is by no means a great movie. It’s not even a very good one. However aficionados of horror and the Friday the 13th series should appreciate what it tries to do for the franchise, something no other film in the series has the balls to do. Without it, would Friday the 13th have been such a reinvigorated and successful series that’s legacy has held strong for today and tomorrow?